Liverpool staged one of the most dramatic comebacks Anfield has seen to overcome Borussia Dortmund in a classic and reach the Europa League semi-finals. Jurgen Klopp's side were twice left needing three goals to go through in the face of Dortmund's rapier attacks - but climbed the mountain twice with Dejan Lovren's injury-time header from James Milner's cross concluding a night packed with drama and emotion. Anfield commemorated the 27th anniversary of the Hillsborough disaster, in which 96 supporters died, with an impeccably observed minute's silence before kick-off - followed by a thriller that will be recalled for generations for sheer excitement and a finale that sent Anfield wild. The Bundesliga side struck twice inside the first nine minutes through Henrikh Mkhitaryan and Pierre-Emerick Aubameyang - both after swift breaks, with the latter sealed by a crisp 14-yard strike - to take a 3-1 aggregate lead in the tie. The German side missed numerous more chances to extend their lead as Liverpool struggled to cope with their attacking threat. How good is Liverpool's record in European competitions? The Reds slowly grew into the game, creating and missing a succession of chances. Even when Divock Origi gave them hope early in the second half - slotting the ball through the legs of keeper Roman Weidenfeller - it seemed to have been snuffed out by Marco Reus's cool 57th-minute finish. They still needed three goals with less than 25 minutes left but Philippe Coutinho's low shot cut the deficit and when Mamadou Sakho headed in after 77 minutes, Liverpool stood on the brink of something remarkable. Amid riotous scenes, Lovren rose to head home in stoppage time in front of the Kop to spark chaotic celebrations and seal a win that will take its place in Anfield folklore. Klopp received a rapturous reception from the fans who idolised him in Dortmund when he walked along the Anfield touchline before kick-off - but he then inflicted agony on the club he took to two Bundesliga titles and the Champions League final. As Liverpool chased the game in the closing stages, Klopp was almost wound up to the point of frenzy, turning around to the crowd beneath Anfield's directors' box whirling his arms in encouragement and gesturing wildly for more vocal support. It kept the momentum going and Liverpool's supporters believing right through the dark moments when Dortmund controlled the game, inspiring his players to that sensational finale. The turnaround revived memories of the so-called 'Miracle of Istanbul' in 2005 when they came from 3-0 down at half-time to win the Champions League final against AC Milan. This may not bring a trophy, but Klopp can now take his place alongside other Liverpool managers who have their names alongside famous victories. When Klopp urged Liverpool's players to take a bow in front of the Kop after they claimed a 2-2 draw with West Bromwich Albion in injury time earlier this season, he was mocked and the gesture was taken as a signal of how low expectations had fallen. The bow was back at the final whistle here and no-one would begrudge Klopp or anyone else for taking in the acclaim. When Klopp took over from sacked Brendan Rodgers in October, he set about rebuilding the relationship between Liverpool's players and disillusioned supporters. He has already forged the bond and nights like this will only cement it further. Liverpool could have gone under when they needed three goals to go through but they created a host of chances throughout the game and not for one moment did they resemble a team who felt the task was beyond them. On and on they came against a Dortmund side who, while dangerous in attack, gave Liverpool a chance at the back all night - one chance too many in the end. Anfield has seen many great nights and this can be added to the list. It almost seems an insult to suggest it after the feast of football witnessed, but for all the drama and the surge of attacking football that eventually swept Dortmund aside, Liverpool still look so vulnerable at the back. Sakho is a fans' favourite and contributed a goal but he was guilty of poor positioning that contributed to all three Dortmund goals. With left-back Alberto Moreno also a weak link, Klopp has work to do in the defensive areas - but no-one was too concerned with that after a truly remarkable night. 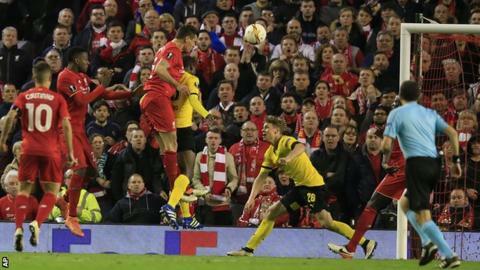 The victory over Dortmund continued a long tradition of famous and emotional European nights for Liverpool. The most memorable of these surely remains the 2005 Champions League final, when Rafael Benitez's team came from 3-0 down at half-time to draw 3-3 with AC Milan before winning the match on penalties. Liverpool fans often talk about the spirit of Istanbul - and it was clearly in evidence on Thursday. But it is not the only memorable European night for the club. In December 2004, Liverpool needed to win by a margin of two clear goals against Olympiakos to qualify for the knockout stage of the Champions League. Rivaldo put the Greek side ahead but Liverpool fought back with Steven Gerrard scoring a late winner. In 1977, Liverpool returned to Anfield for the second leg of a European Cup tie against French side St-Etienne trailing 1-0. The Reds took the lead but needed to score twice more after Dominique Bathenay's equaliser. However, goals from Ray Kennedy and super-sub David Fairclough ensured they did just that. Dortmund scored more goals (2) in the opening nine minutes of the game on Thursday than German opposition had managed in 13 previous trips to Anfield (1). Liverpool will be in Friday's draw for the last four of the Europa League. That will be covered in Sportsday on the BBC Sport website. Klopp's team return to Premier League action when they play at Bournemouth on Sunday, with kick-off at 13:30 BST. Dortmund, who are seven points behind leaders Bayern Munich in the Bundesliga, host Hamburg on Sunday. Match ends, Liverpool 4, Borussia Dortmund 3. Second Half ends, Liverpool 4, Borussia Dortmund 3. Attempt missed. Ilkay Gündogan (Borussia Dortmund) right footed shot from outside the box is close, but misses to the left from a direct free kick. Marcel Schmelzer (Borussia Dortmund) wins a free kick in the attacking half. Goal! Liverpool 4, Borussia Dortmund 3. Dejan Lovren (Liverpool) header from the left side of the six yard box to the bottom left corner. Assisted by James Milner with a cross following a set piece situation. Marcel Schmelzer (Borussia Dortmund) is shown the yellow card for a bad foul. Nathaniel Clyne (Liverpool) wins a free kick on the right wing. Foul by Marcel Schmelzer (Borussia Dortmund). Julian Weigl (Borussia Dortmund) wins a free kick in the attacking half. Adrián Ramos (Borussia Dortmund) wins a free kick on the left wing. Attempt missed. Dejan Lovren (Liverpool) left footed shot from the left side of the box is too high. Assisted by James Milner following a set piece situation. Foul by Mats Hummels (Borussia Dortmund). Substitution, Borussia Dortmund. Adrián Ramos replaces Marco Reus. Substitution, Borussia Dortmund. Ilkay Gündogan replaces Gonzalo Castro. Substitution, Liverpool. Lucas Leiva replaces Emre Can because of an injury. Goal! Liverpool 3, Borussia Dortmund 3. Mamadou Sakho (Liverpool) header from very close range to the centre of the goal. Assisted by Philippe Coutinho with a cross following a corner. Substitution, Borussia Dortmund. Matthias Ginter replaces Shinji Kagawa. Delay in match Emre Can (Liverpool) because of an injury. Corner, Liverpool. Conceded by Roman Weidenfeller. Attempt missed. Dejan Lovren (Liverpool) right footed shot from the centre of the box misses to the right. Assisted by James Milner with a cross following a corner. Corner, Liverpool. Conceded by Gonzalo Castro. Attempt blocked. Nathaniel Clyne (Liverpool) right footed shot from outside the box is blocked. Assisted by James Milner. Corner, Liverpool. Conceded by Marcel Schmelzer.